With my mind on the idea of having a picnic, I totally disregarded the local weather forecast's doomsaying that it was going to be at best cloudy in Wiltshire today. I have mentioned my love of picnics before. It's another one of those family-oriented activities that the husband can't stand. He gets twitchy the moment I mention the idea and I'm sure he prays for the weather to turn before we make it out the door. Completely unfazed by all the potential pitfalls, I chose to have a go at Jamie's Banana Bread. I should've stopped when I read the name 'Jamie Oliver'. I have had zero success with his recipes this year (aside from Mulled Cider, which doesn't really count). I should also have re-read my Mulled Cider post about how pictures of his recipes on the web look nothing like they do in reality - even factoring in the fact that I don't cook for a living. I came across the recipe when researching breakfast recipes for this week. I'm on a pretty intensive course and have been warned by my boss that it's going to be a tough week and if I don't do well and have spent the week responding to work email, tweeting and blogging then I won't be very popular on my return to work. So I have decided to go with breakfast recipes to get things over and done early in the day, short posts like I did on holiday and blind panic that I'm going to fail and it will all go horribly wrong. Anyhow, this recipe looked like the perfect picnic food. Soft banana bread, studded with nuts and glazed with honey. 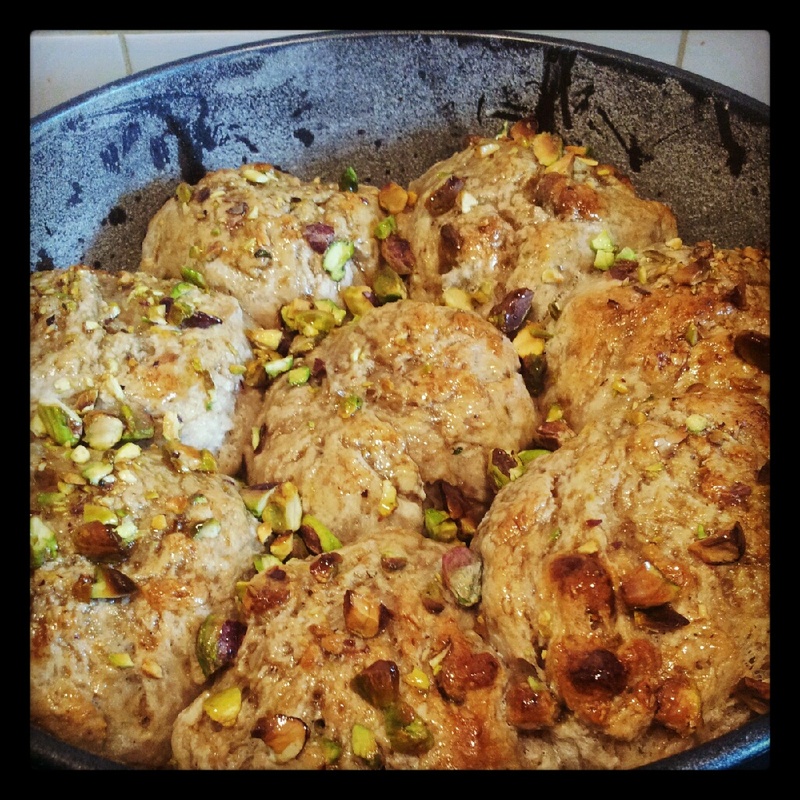 Not being a honey fan, I replaced it with maple syrup and used pistachios instead of almonds for the lovely green colour. My finished bread was slightly grey inside (understandable with the banana content, but not at all visible in Jamie's picture) and soft, but not all spongy like the picture seems to indicate. I also have issue with the size of the bread in the picture. Jamie says to use his basic white bread recipe and divide it into ten balls. I used half of the bread recipe and managed eight gigantic rolls. With his cheeky chappie 'bish, bash, bosh' approach to writing, he also neglects to mention what size and shape tin to put them into. I put my eight into my 9" springform tin and they filled it nicely. The taste was okay even if the texture was a little disappointing based on the picture on the website. But it was chewy, they are nice warm, Miss A loved them and I think they'd work well in the winter with a big mug of hot chocolate. I like the concept and will try adapting the recipe further in the future - but from now on, I'll stick to Dan's baking recipes. As pretty much everyone I know who has tried a recipe from Short and Sweet or his Guardian recipes will tell you - quite simply they do what they say on the (baking) tin. Stick to real food Jamie and leave the baking recipes to the experts.